For several weeks, Morro Bay officers had been investigating reported drug activity at a home in the 2300 block of Hemlock Avenue. Following a detailed investigation, police obtained a search warrant for the home. At about 7 a.m. on Tuesday, Morro Bay police and the San Luis Obispo County Narcotics Task Force conducted a search of the home. 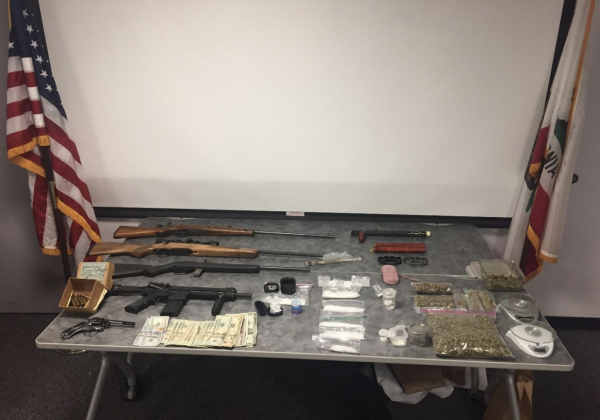 During the search, officers seized approximately 163 grams of methamphetamine, more than 270 grams of processed marijuana and cash believed to have been obtained through narcotic sales, according to the Morro Bay Police Department. Additionally, authorities discovered firearms, as well as armor piercing ammunition and weapons used in hand-to-hand combat. Officers arrested three Morro Bay residents and booked them into the San Luis Obispo County Jail. Officers arrested Robert G. Hurless, 25, on charges of possession of a controlled substance for sale, possession of a controlled substance while armed with a firearm, possession of stolen property, possession of a nunchaku, possession of a switchblade knife and possession of metal knuckles; Brook V. Gaughan, 51, on charges of possession of a controlled substance and maintaining a residence for unlawful activity and Paul R. DeFalco, 33, on charges of possession of a controlled substance for sale. Investigators are asking anyone who has information about the case to contact the Morro Bay Police Department at (805) 772-6225 or Officer Luke Riddering at (805) 772-6225 ext. 468.